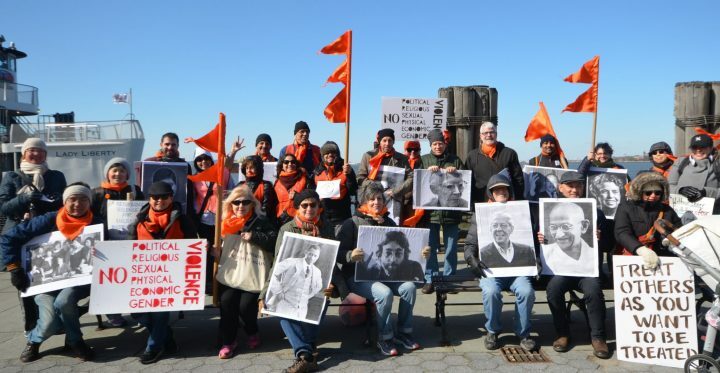 Walking 12 miles ​from the southern tip of Manhattan to its top, a small but hearty group of activists from the metro New York area held a NYC Walk for Nonviolence on April 8. 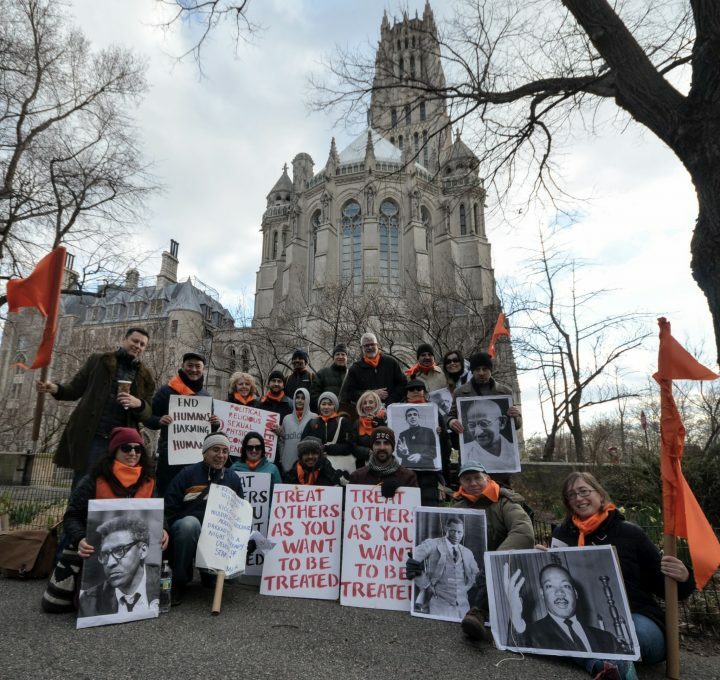 The walk was organized to commemorate the 50th anniversary of the assassination of Martin Luther King, Jr. and to publicly honor the many contributions to nonviolent action made by King and other individuals, groups, and movements before and after him. 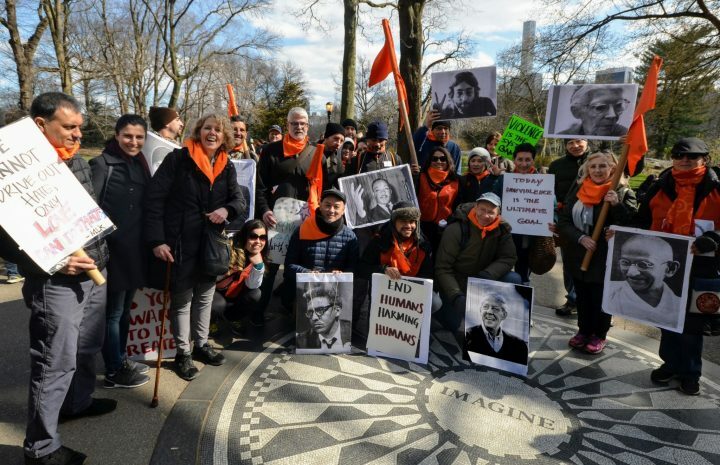 “King is a reference to many of us because he understood that nonviolence is not just an organizing tactic but also a ​fundamental principle​ connected to something deep within the human consciousness,” said Dennis Redmond, one of the event organizers. As they traveled their way up the island, walkers stopped at important “nonviolence landmarks” in order to remember and take inspiration from some key historical figures. At each stop, they shared personal testimony, joined in ceremony, sang songs, or listened to excerpts from talks or letters. The morning began at Battery Park, in view of the Statue of Liberty, a universal symbol of tolerance, and ended at Riverside Church, site of King’s legendary “Beyond Vietnam” speech in 1967 in which he described the civil rights, anti-war, and anti-poverty movements as one and the same. In between, there were tributes to Gandhi, Silo, Dorothy Day, Bayard Rustin, Eleanor Roosevelt (recognizing her role in the drafting and passage of the Universal Declaration of Human Rights), the Quakers, Margaret Sanger (who opened the nation’ first legal reproductive rights clinic), Occupy Wall Street, Paul Robeson, and John Lennon. The event was organized by The Community for Human Development, The Community of Silo’s Message, and Pressenza NYC and co-sponsored by Pax Christi Metro; Southern Poverty Law Center on Campus (Columbia University chapter); New York Day of Remembrance; Code Pink: Women for Peace; and Movimiento por la Paz en Colombia.